1. Theater – Slowgirl by Greg Pierce, with Sarah Steele and Zeljko Ivanek, at Lincoln Center’s new Claire Two Theater. All tickets $20. Extended through August 5, 2012. 2. Art – Ghosts in the Machine at the New Museum. The new exhibit spans fifty years and traces the complex historical passage from the mechanical to the optical to the virtual. FREE Saturday (7/21/2012) 12-5pm with a visit to the museum’s block party. Otherwise $14 General Admission/$10 Student. FREE every Thursday 7pm-9pm. Through September 30, 2012. 3. Music – B.o.B FREE Secret Show at the Highline Ballroom; Sunday, July 22 at 9pm. Doors open 7:30pm. FREE with Ticket. Tickets available at the box office. Written and performed Leguizamo-style, this one-person show celebrates the joy of survival in a world often intolerant of difference. As a queer boy/stud/trans person, D’Lo unapologetically takes center stage and uses his fluidly morphing form and spot-on timing to bring the fierce with the funny. 6. Design/Performance – GlassLab Glassmakers from Corning Museum of Glass create pieces with contemporary designers. Glass blowing and all. Saturdays and Sundays from 1 to 6:30 through July 29th. This weekend designers include Peter Buchanana-Smith and Paul Sahre. On Governors Island. FREE. 7. Art – Rineke Dijkstra: A Retrospective at the Guggenheim. Large-scale color photographs. Portraiture with a twist. Through October 8, 2012. Pay-what-you-Wish Saturdays from 5:45 to 7:45. 8. Theater – Uncle Vanya at the Soho Rep in Tribeca, through August 26th. 99¢ Sundays same day at the door. Line forms one hour before show. Limit 2 tickets per person. 7:30 pm. 99¢. 9. Dance – Pilobolus at the Joyce Theater. Through August 11, 2012. A limited amount of tickets available for $10 by calling the box office (212-242-0800). At the time of posting, only 1 ticket was left for this weekend, so best to try in advance. Showtimes and programs vary. Also in Food: Les Salonnieres Country Blues Potluck Under the Stars. Dinner and Wine tasting. Bring a country-themed dish. Saturday, July 21, 7pm – 1am. Williamsburg Private Residence. Tickets $10. Art on the Beach: Coney Island Annual Sand Sculpting Contest and Unity Day. (Here’s a video on last year’s event) Saturday, July 21, 12-5 pm. FREE. 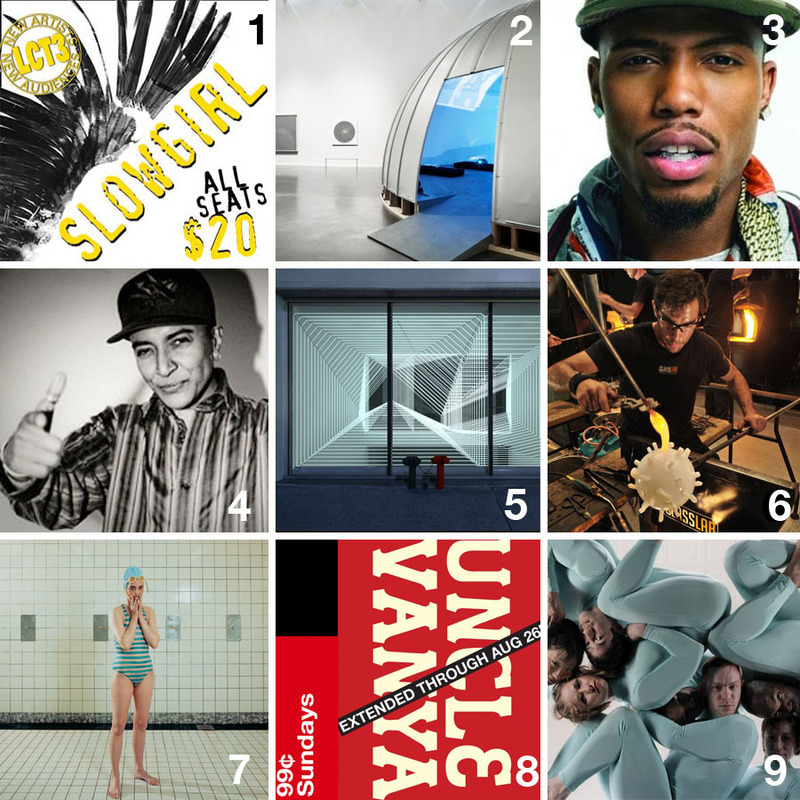 Check last week’s Culture on the Cheap for additional (ongoing) events. This entry was posted in Architecture, Art, Event, Film, Food, Fun, Industrial Design, Music, NYC, Photography, Pop Culture, Street Art, Stuff We Like. Bookmark the permalink.